Are you looking for AC tune up in Hudson County, NJ? 1st Choice Plumbing, Heating & Drain Service is a licensed and bonded company specializing in AC tune up in Hudson County, NJ services. We serve homeowners and business owners with prompt and professional AC tune ups to restore or maintain function of your unit(s). We feature free AC tune up estimates and affordable prices, giving you the results you need while remaining within your budget. With First Choice Plumbing, Heating and Drain Service, you can be sure to receive expert and professional service. As a property owner, you just expect your AC units to work when needed. This simply means anticipating cool air throughout New Jersey's humid summer months. Disruption to service not only causes discomfort at home or the office, but can cause health problems and affect your quality of living and workflow. The last thing you need is to worry about how to stay cool in the summer - you deserve to feel comfortable at the office and home. When you first suspect an issue with your AC system, call our specialists for prompt and professional service. We understand how stressful it can be to live in New Jersey without air conditioning. Committed to your well-being and satisfaction, our AC technicians are available with around the clock, 24/7 emergency AC tune up services. More than that, we feature express arrival time to your location within 45 minutes. Without delay, our technicians will restore function to your AC unit. With a 100% guarantee on all of our AC services, you can rest-assured knowing that your AC tune ups are in the hands of trained, experienced experts with the knowledge to promptly determine the problem and work towards long lasting solutions. If you notice that your AC unit isn't performing at optimal strength, or isn't functioning at all, don't panic! 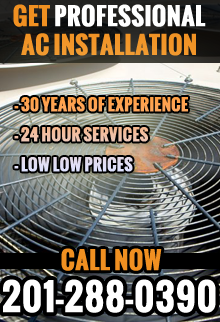 Our experienced AC technicians make the necessary repairs and restore your quality of living without delay. We have the skills, equipment, and efficiency to get your AC unit up-and-running again! For more information about an AC tune up in Hudson County, NJ, call First Choice Plumbing, Heating and Drains at 201-288-0390.